Learn the ancient art of baby massage in the beautiful surroundings of Strandhill. The course will teach you how to massage your baby and how to connect with your baby through a simple sequence of easy to learn strokes. Each course lasts 5 weeks and each class is held on a Wednesday morning from 11am until 12.30pm. Each class allows 1 hour for baby massage and 30 minutes mum time to relax over tea/coffee and cake, meet new friends, share experiences and swap stories! Classes are small,relaxed, informal and baby led. You are free to feed, change and comfort baby throughout as necessary. Cushions, padded mats and blankets are provided for comfort. The course is suitable for babies from 4 weeks to pre-crawler. It is also suitable and beneficial for premature babies and babies with special needs. The cost of the course is €100 which is refundable on certain health insurance plans – please check with your provider. The price includes oil, handouts and post class refreshments. Opportunity to take time out from our busy lives and meet other mums in a similar situation. My name is Lorna Middleton. 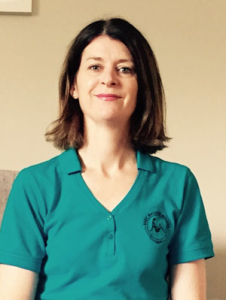 I am a Certified Infant Massage Instructor (CIMI) accredited by the International Association of Infant Massage(IAIM) and a member of Baby Massage Ireland. I am a mother of three children, a registered Nurse/ Midwife and I continue to work part time as a staff nurse. Each course lasts 5 weeks and each class is held on a Wednesday morning from 11am until 12.30pm. Each class allows 1 hour for baby massage and 30 minutes mum time to relax over tea/coffee and cake, meet new friends, share experiences and swap stories! The cost of the course is €100 which is refundable on certain health insurance plans – please check with your provider. The price includes oil, handouts and post class refreshments. 1:1 Private course in your own home available on request. €150 for 4 wks. Help ease the symptoms of colic with a one hour private instruction in your own home. 10% discount offered on the 5 wk course should you choose to book a place. The class was very well organised and structured. The baby loved the massage and we felt very much at ease. I would highly recommend it and it is great to meet new parents .